STEELERS FANS: “Cowboys Have Most Annoying Fanbase” | "IT'S A STEELERS WORLD"! Yesterday I posted a poll question asking “IT’S A STEELERS WORLD” group members and blog followers ‘which NFL team has the most annoying fanbase’..and the fans have spoken. As if the above photo doesn’t explain it all. The Dallas Cowboys topped the list with 42% of the votes. Which of course came as absolutely no surprise to me. I mean, what other team do Pittsburgh Steelers fans have such a long standing hate for than the Brokeback Cowboys? Ever since going up by one Super Bowl back in 1995 due to two Neil O’Donnell I’ll advised “pick 6’s” to a certain player I prefer not to name, the Crygirls fans have been the definition of annoyance. To go along with them being the most annoying fans of the NFL, they are also the most “delusional” fans as well. Because even with the comedic stylings of quarterback Tony Romo over the years, Cowboys fans still oddly enough believe that they will make it to the Super Bowl year after disappointing year. Not to mention the annoying rehashing of the “Dez Caught It” crap that still floods Twitter and Facebook pages to this day. And for that we thank ESPN’s First Take host, Skip Bayless for that travesty. Yet it’s us Steelers fans that are living in the past, or so they continue to claim. Oh, and let’s not forget the self proclaimed “America’s Team”..which no one appointed to them except themselves. 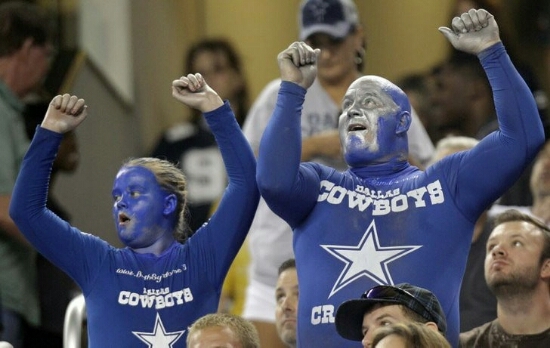 To top it all off, the Cowboys have the most largest and annoying “bandwagon” fanbase as well. Fans that don’t come out of the woodwork unless they get a win that week. While losses keep them buried under their misery. Fans that claim to be fans since beginning, but can’t name a single backup player on their roster, which is bandwagoning at its best. Long story short, if us Steelers fans are living in the past, then the “6 Rings” we own is the future you will never obtain! So deal with it, and continue to hope and pray that you will ever be as successful as the Pittsburgh Steelers. ← VIDEO: The Nation Has Expanded.. “IT’S A STEELERS WORLD”!